Area citizens join protest in Austin against Texas corridor. Texas : Feature : Columns : "They shoe horses, don't they?" AUSTIN - A diverse crowd of at least 300 made their opposition to the Trans-Texas Corridor known during a rally on the south steps of the State Capitol Building Tuesday morning. The crowd, including large contingents of Fayette and Wharton County residents, vented their disgust with the project and those who endorse it with such chants as "Clean House," "No More Perry," "Sold Out" and "1-2-3-4, We don't want this corridor." It's a matter of personal property rights, said Michael Beard of Wharton County. "It is my understanding that all property within the corridor will be controlled by state concerns," he said. "This is a free-enterprise nation and that kind of idea goes against the beliefs this country was founded on. It smacks of communism." The Trans-Texas Corridor, proposed by Perry in 2002, would be a 4,000-mile transportation network costing some $175 billion over 50 years. The corridors would be approximately 1,200 feet wide and would parallel existing highways in the state. The first such proposed corridor would parallel Interstate 35. The network would be financed mostly if not entirely by private money. The road builders would then charge motorists tolls. Those attending Tuesday's rally opposing the Trans-Texas Corridor, who included residents of Fayette and Wharton counties, protested with signs made both professionally and by hand, along with a "Don't Tread on Me" banner, harking back to the Revolution. 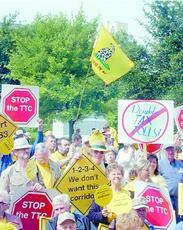 Rally organizer Heidi Ullrich of Fayette County said that the main goal of Tuesday's gathering was to support House Bill 3363, which would place a two-year moratorium on the development of the corridor and would bar the Texas Department of Transportation from imposing a new toll on any portion of a state highway for the next two years. Wharton County farmer Cedric Popp, who organized a busload of about 45 county residents to the rally, said that given that much time he is confident the corridor plan would cease to exist. "In talking to people about it, I've only met two kinds," he said. "Those who haven't heard about it and those who are opposed to it. This is something nobody wants. But we need to make more people aware of what is happening and the house bill would give us that time." The group wanted the state House Transportation Committee to hold a hearing on the legislation, but the Associated Press reported earlier this week that the panel didn't plan to consider the bill. Ullrich said Tuesday that if HB 3363 didn't survive committee scrutiny, then the group would seek a legislator who would be willing to add it to another bill. Among the elected officials addressing the crowd at the Capitol was Fayette County Judge Edward Janecka. The commissioners court in Fayette is one of 20, along with that of Wharton, that have passed resolutions opposing the idea. "The issue is real simple," Janecka said in an interview before he spoke at the rally. "This is the largest transportation bill in the state's history and no one here (in Austin) knows exactly what it is. All we are asking is that they put it out on the table and let everyone in the state look at it. "Everything has been done in the middle of the night and under the table," he said. "There are water and a lot of other issues involved that have nothing to do with transportation." Janecka told the crowd that, "We need to say no to the largest land grab in Texas history, say no to freeways being converted to toll roads and say no to TxDoT being replaced by EuroDoT." He was referring to a state contract with Cintra Concesiones de Infraestructuras de Transporte SA of Madrid, Spain, to create a master plan to finance and build Trans-Texas Corridor-35. Several other speakers made reference to EuroDot in their presentations, including the highest state official speaking at the rally, Texas Comptroller Carol Keeton Strayhorn. "Texas should not be sold out to foreign interests," she said. "Texas farms and ranches should be for Texas farmers and ranchers. We should not let a Europeans consortium take our Texas birthright. Our elected leaders should not be asking us to give them our land and then insist we should have to pay to drive across it (as toll roads.)" Referring to the proposal as the "Trans-Texas Catastrophe," she urged Texans to oppose the plan in order to protect personal property rights, and said that anything to do with the corridor should be blasted off the bureaucratic books. Strayhorn said that the state should hold a referendum on the matter and let people vote. "Gov. Perry wants to offer you more roads, slow roads and toll roads," she said, "when it should be our way, today, for freeways." Other elected officials speaking during the rally included state Senator Ken Armbrister, D-Victoria, and state Representatives Robbie Cook, D-Eagle Lake, and Glenn Hegar, R-Katy. Armbrister reminded the crowd that the two original bills that would have created the corridor failed to make it through the Legislature. The current plan was part of an omnibus bill that was "sold for improving residential transportation in the metroplexes," he said. "From that point, they used free scale authority to extend it to the whole state." Cook complimented the assembly for making the effort to influence legislators. "Grassroots support like this means something," he said. "The best way to put this on the radar screen is to do what you accomplished here today. I know you've taken time today away from your farms, ranches and jobs to exercise your right to be heard." Hegar said that the rally reminded him of being 16 and driving his grandfather around the state in opposition to a bullet train. Several different bills are being introduced to limit the impact of the Trans-Texas Corridor, he said. These are jointly sponsored by members of both parties and by both urban and rural legislators, including one that was co-written by Cook, Hegar added. Some of the speakers didn't go far enough for those protesting during the rally. Flatonia resident Kathryn Geesaman said that she wanted more from Cook than a plan to limit the width of the corridor. "I wanted to hear 'let's kill this,'" she said. "A lot of what is being proposed is little bandages. We need to stop this. If they presented it to the people honestly, it would be soundly defeated." Ullrich said that she will continue to work with her own organization in Fayette County, Citizens Against Trans-Texas Corridor. She will also work with David and Linda Stall, who operate a Web site, www.corridorwatch.org that opposes the corridor plan. Barry Halvorson is a reporter for the Advocate. Contact him at 361-798-3888 or hvilladv@vicad.com.